Posted on Mon, Jan 23, 2012 : 5 a.m.
Jean de La Bruyere, a French essayist and moralist who died in 1696, said, "There is no road too long to the man who advances deliberately and without undue haste; there are no honors too distant to the man who prepares himself for them with patience." 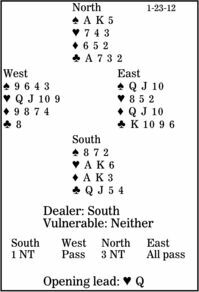 There is no contract too hard to the bridge player who advances deliberately and without undue haste; there are no honor cards too distant to the player who prepares himself tricks from them with patience. This week we will look at getting the maximum out of the honor cards we have been dealt. South is in three no-trump. After West leads the heart queen, what should declarer do? As mentioned before, do not wait for stoppers in all four suits before opening one no-trump. Partner is expected to cover your weak suit. If he doesn't, get a new partner, one who holds better cards! Always advance deliberately at trick one, pausing to count your top tricks and to form a plan. Here, you have seven immediate winners: two spades, two hearts, two diamonds and one club. You need two more tricks, which must clearly come from the clubs. Inexperienced players will run the club queen, thinking this is a finessing position. And if the suit splits 3-2, they will survive. But it is the wrong play, losing to some 4-1 divisions. When you do not have the 10, lead toward the hand with the two honors. Take trick one, play a club to dummy's ace, and return a club toward your hand. Here, after you win the trick, cross to dummy with a spade and lead another club -- contract made honorably.